This is a good comment. I like this comment. I decided to investigate this comment. And, as it turns out, StroShow was spot on. The bigger question here is how umpires call a pitch that’s much different than the one which has directly preceded it. I suppose you could take that and turn it into questions about that effect on batters, too — which is interesting in its own right — but let’s limit ourselves to umpires for now, which is probably easier anyways. Anyways, the broad concern here is the effect of change on an umpire’s call-making. This “change” could include the location of the pitch. It could include the type of pitch. It could include the speed of the pitch (which I would guess doesn’t have a huge effect). But the more specific question here is about location and, narrowing in even further than that, the question is about the height of the pitch. We’ll start there. There are a few methods that can help answer this question, and the one I’m going to use here is to find the change in the percentage of pitches that are called strikes when a pitcher suddenly throws a pitch in a different vertical spot than he had been. More specifically, I’m going to take the percentage of pitches in the zone that are called strikes and compare it to the percentage of pitches low in the zone, that come after high pitches, that are called strikes (or the other way around – pitches high in the zone that come after low pitches). The pitches all occurred in the same at-bat, and the batter and pitcher were the same for all three pitches. Either the first two pitches were more than 3 feet off the ground and the third was less than 2, or the first two were less than 2 feet off the ground and the third was more than 3. The middle of the strike zone is about 2.5 feet off the ground, and it extends to roughly 1.75 at the bottom and 3.4 at the top. Of course, that varies based on the height of the batter (and the tendencies of the umpire). The batter did not swing at the third pitch. The umpire doesn’t do much when the batter swings. The at-bat occurred in 2010 or later. Some background. 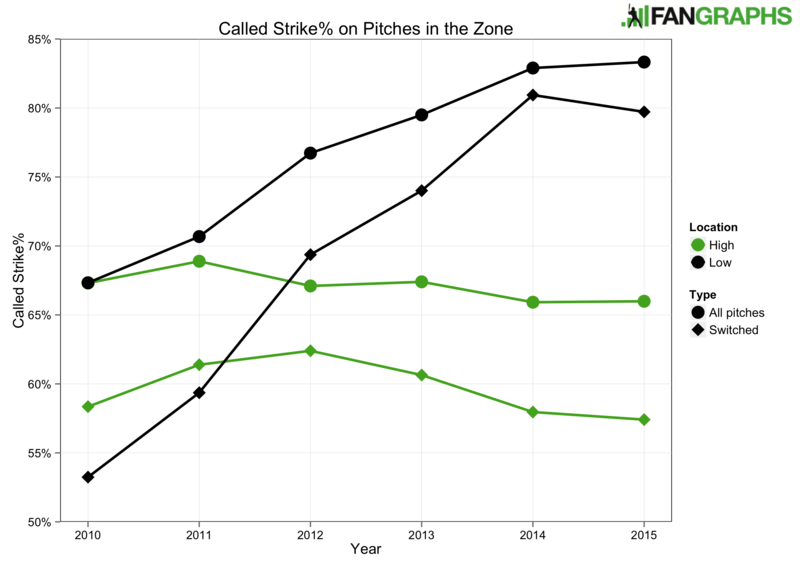 In the past siz years, 49.2% of pitches were thrown in the strike zone, and 83.2% of those were called strikes. That may not be enough to appease the robot ump-wanting crowd, but umpires are human, and so that’s pretty good — better than you or I could do. Umpires are good at their job under normal circumstances. Good becomes noticeably less good when the pitch is either high or low in the zone. That’s intuitive. By selecting only those pitches, we’re taking away the pitches in the middle of the zone, which are gimmes. We’re looking at the tougher calls, so the accuracy is going to decline. But what’s surprising is that “less good” becomes “much worse” when the high or low pitch was preceded by two pitches of the opposite location. It does seem, though, that umpires have been improving in this regard for low pitches preceded by high pitches. That might just come with the fact that umpires are calling more low strikes than they have been before, but regardless of why, that’s a good sign. However, at the same time, there has been no demonstrable improvement for high pitches preceded by low pitches – which is part of the reason I suspect the increased accuracy for low pitches is because of the strike zone expansion. 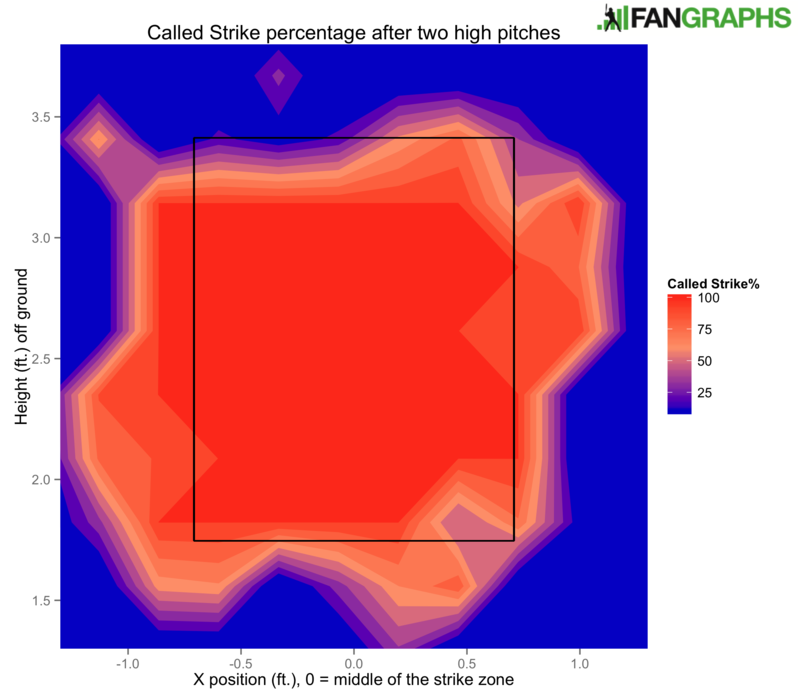 There’s a drastic shrinking of the zone after two low pitches. 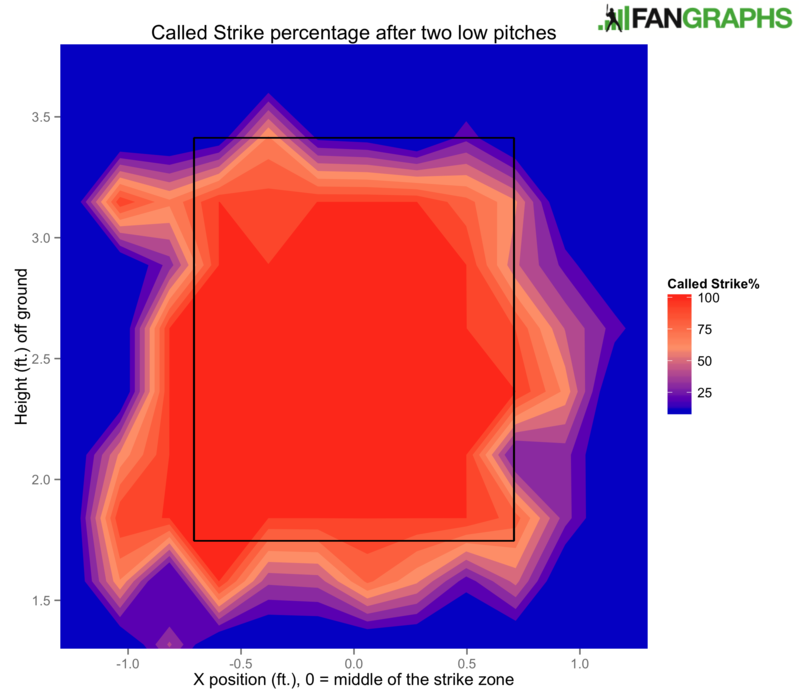 Not so much after two high pitches – in fact, it looks like the zone expands horizontally in that case – although there is a slightly paler color in some parts of the bottom of the zone, indicating a lower called strike rate, especially in the bottom right, which is inside to lefties and outside to righties. The box in the middle of the graphic is the rulebook strike zone; this, again, changes based on the batter’s height, but the box extends to where the top and bottom are for the average hitter. There’s not a whole lot of spread anyways – one standard deviation is less than half an inch at both the top and bottom. Another note about the graphic: the data used to make it is from 2015 only. 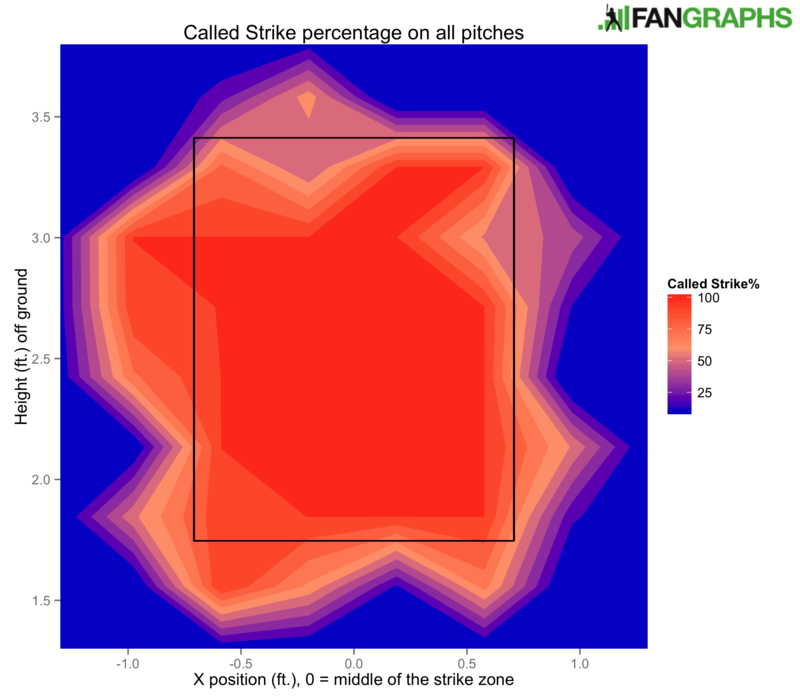 Since the strike zone has changed so much every year, I didn’t want to mix up the data with different types of strike zones. We have, I think, some very solid evidence here that umpires are affected by pitchers throwing pitches in a different place from where they had been. Going back to the broader question at the beginning of this article, I think it’s certainly possible that pitch type, speed, or other factors may affect umpires, as well. And batters, too, are probably affected by this to some degree. There’s certainly more work to be done here. We’ve yet to uncover much about pitch sequencing, but I think this is a step in the right direction. Quantifying the effects of previous pitches on the pitch in question is crucial to learning more about it. We hoped you liked reading The Consequences of Changing an Umpire’s Eye Level by Jonah Pemstein! Jonah is a baseball analyst and Red Sox fan. He would like it if you followed him on Twitter @japemstein, but can't really do anything about it if you don't. One immediate reaction: you should split the zones by batter hand. Lefties and righties have different called strike zones (sorry purists) and to the extent lefties and righties get pitched differently it could cause the different zones you’re comparing to contain different samples of hitters. You might also want to control for count for similar reasons. And batter height while I’m thinking of it. Definitely. There’s more to be done here, for sure. I intend to build off of this, and a more complex model could be the next step.